I'm buckling under the weight of a million questions. Did she walk along here? Did the people in the shops and on the street see her? Speak to her on her last day here? Am I walking right past someone who might have seen her get on the bus back to David, leaving Boquete? Or someone who actually knows what happened to her? I try to scratch that one out of my head, but it sticks fast. Mackenzie is torn apart after her mother goes missing. 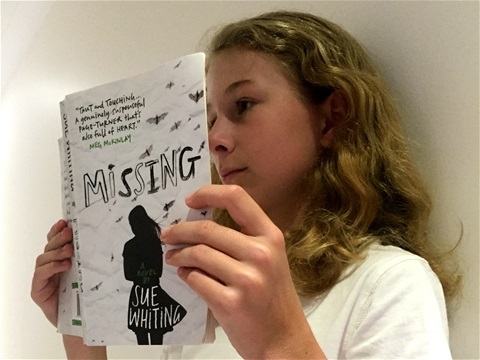 She sneaks from Sydney with her father in the middle of the night to find her mum in Panama. Now Mackenzie's life seems even wilder. They uncover secrets about her mother's past, but what really happened to her and where is she now? This is a heavy book. The impact that Mackenzie's mother's disappearance has on her family is understandably large. Directly before she finds that her mother is missing, Mackenzie is happy because she is getting a special award at school. However, she sees her dad and her nans' faces are 'grey like a rainy day' and then discovers her mother has been missing for nine days. Mackenzie realises the severity of the situation and completely forgets about her certificate. Missing touches on the depression suffered by Mackenzie's father - he goes completely out of his mind and does crazy things such as leaving Mackenzie to look after herself. She struggles considerably and is upset when he is down in the dumps or away. Mackenzie's grandmother is her lifeline and she always wishes that she was there to help her. I share common ground with Mackenzie. We have both recently started high school and love art. Yet I can only guess what it would be like to be in her shoes; I think I would be struck down with a mixture of emotions. I would not know what to feel - grief for if the worst had happened or hope if Mum was still alive. It would be a terrible situation and Sue Whiting has described it conscientiously. Missing has been deliberately written out of sequence, jumping between the 'now' and the 'then'. The start of each chapter lists the location and how long Mackenzie's mother has been gone. The order is originally confusing, but makes more sense later on.